How Do You Spell Satellite? Home » Spelling Dictionary » How Do You Spell Satellite? 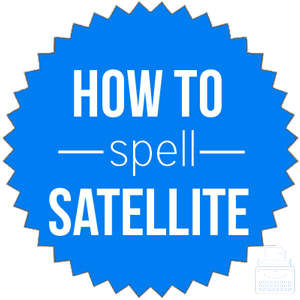 Spelling of Satellite: Satellite is spelled s-a-t-e-l-l-i-t-e. Don’t forget there are two “-l’s”! Definition of Satellite: A satellite is an object or vehicle designed to orbit the earth, the moon, or some other celestial body and is used to relay radio signals or capture images. It may also refer to a small unit within a larger system that is controlled or managed by a centrally-located body or unit. Pronunciation of Satellite: Satellite is pronounced sat-el-lite. What does satellite mean? In most cases, satellite is used as a noun. The most common use of the word is as an object that orbits a planet or some other celestial body. Most of these types of satellites are used to reflect a signal. The images of the planet were sent by the satellite. Meteorologists use satellites to help them predict the weather. A satellite can also describe an object or person that is lesser in size or authority than the unit or body commanding it. Sometimes, satellite functions as an adjective describing something of or related to a satellite, or to the relay of electromagnetic signals by communications satellites. The car’s master computer connects everything from the engine parts to the entertainment systems and satellite. His only option was to try to make contact using the satellite. Satellite is used alongside many nouns to describe the particular technology type or position, though there are really no common phrases or idioms in which the word is used. Satellite Imagery: any photographs taken by satellites. If we go back far enough, the Latin word originated from the Etruscan word zaθilaθ, which refers to the person who carries or strikes with an axe. The appropriate synonym depends upon the type of satellite about which one is speaking. Satellite can be used as both a noun and adjective. Generally, it refers to an object or body that is controlled by or dependent upon a larger, more powerful unit. When used as an adjective, it describes something that is on the periphery or a type of technology.